Centre Director Professor Andrew Linzey and Professor Tom Regan have produced the world’s first anthology designed to employ the power of fiction to illuminate our moral relationship with animals. 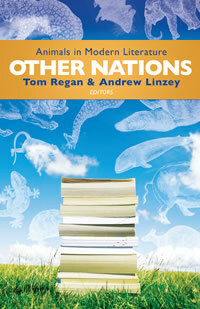 Published by Baylor University Press on 1st October, Other Nations: Animals in Modern Literature includes extracts from writers of great distinction—including Ernest Hemingway, George Orwell, Cleveland Amory, William Kotzwinkle, and Alice Walker. By organizing the literary pieces according to the means by which human beings relate to the animals discussed — as companions, as sources of food, as objects of sport and entertainment, and as subjects in scientific research — the anthology enable readers to relate these texts (and these animals) to their own experiences and to the public debate about animal ethics. Designed as a set text for college and university students, this collection presents various and contrary viewpoints, leaving readers to come to their own moral conclusions. The title is taken from naturalist Henry Beston’s famous line about how “ …animals are not brethren, they are not underlings; they are other nations caught with ourselves in the net of life and time, fellow prisoners of the travail and splendour of the earth”. Further information about the book is available from Baylor University Press here, and information about ordering here.